We provide all full members with a clean look, SECURE, modern RESPONSIVE website and/or upgrade members old websites as part of their membership fee. This includes annual domain name renewal, hosting, security certificate, full search engine optimisation, calendar, full compatibility with mobile phones, iPads, tablets, laptops and desktop PCs. Perhaps more importantly members are promoted via our network of portals, directories and regional websites. 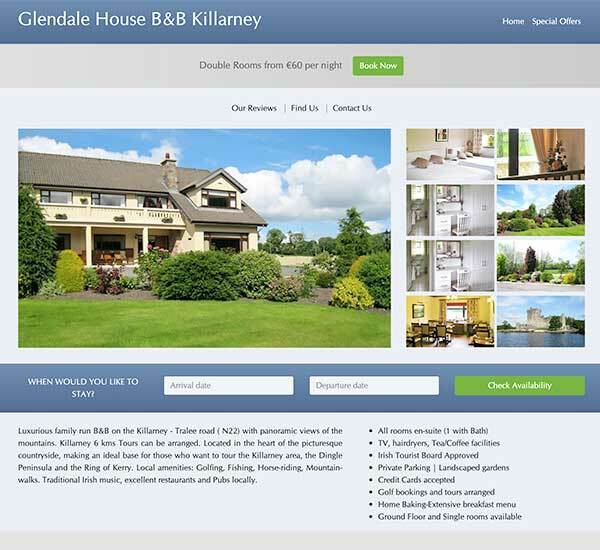 We also provide a WEBSITE BOOKING ENGINE with 'one click' confirmation that automatically updates your website availability. All Bookings from your website are commission-free, and the guest always pays the full room rate to you directly. On our worldwide book-a-bnb.com website, although guests pay a €5 booking fee, they still pay you the total room rate directly. There is no annual fee & the cost of your free dedicated website, domain name renewal & hosting is covered by an 11% booking fee that is taken from the guests credit card only on confirmation of the booking - no monthly commission or invoices.